Migrants try to prepare a meal during a rainfall at a makeshift camp on the Greek-Macedonian border, near the village of Idomeni, Greece, March 9, 2016. Thousands of migrants trying to reach northern Europe are now stranded in Greece after Macedonia closed its border Wednesday, police officials said. The decision comes a day after Slovenia, Croatia and Serbia closed their borders to transiting migrants, with exceptions being made only for asylum-seekers. It effectively closes the so-called "Balkan route" taken by many migrants headed for wealthier nations in western Europe, with Slovenian Prime Minister Miro Cerar saying, "The [Balkan] route for illegal migrations no longer exists." Slovenia's action is in line with a decree made Monday at a European Union meeting in Brussels that EU members must return to enforcement of the open-border Schengen agreement, which says nations can bar entry to any migrants who do not plan to apply for asylum in that country. The new measures put extra pressure on the European Union and its neighbors to handle the crowds of migrants already awaiting help within the EU and in Turkey, where 2.7 million migrants are waiting to continue their journey. 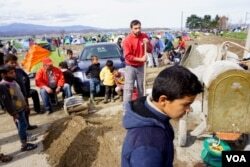 It also exacerbates a dire situation on the Macedonian border. Greek officials said nearly 36,000 migrants and refugees are stranded in the country, including more than 14,000 mainly Syrian and Iraqi refugees stuck in a muddy, unhygienic camp near the Idomeni border crossing with Macedonia. EU leaders and Ankara said Tuesday they had reached a possible deal that would return the thousands of migrants who arrived in Greece from Turkey. After months of disagreements and increased bickering among the 28 EU nations, the leaders said they agreed to give Turkey more than $3 billion in additional funds to help with the nearly 3 million Syrian refugees it is hosting. The EU leaders also agreed to swiftly ease visa requirements for Turks and speed up Ankara's EU accession talks in exchange for its help in stemming migration flows to Europe. In addition, the deal calls for the EU to resettle one Syrian refugee from Turkey in return for every Syrian refugee Turkey takes back from Greece. However, UNHCR refugee coordinator for Europe Vincent Cochetel, who said he did not know the details of the proposed deal, told VOA he worries it may lack safeguards to protect asylum-seekers. All eyes are now on March 17 and the start of a two-day summit to finalize the commitment and agree on a deal that the leaders hope will allow for a return to normalcy along their borders by the end of the year. Europe is struggling to handle its largest refugee crisis since World War II. Last year, more than 1 million refugees and migrants made the perilous journey across the Mediterranean Sea from Turkey to Europe, and roughly 142,000 have arrived so far this year, most of them arriving in Greece.